On Monday, June 6th, 2016 King was diagnosed with Acute Lymphoblastic Leukemia in the high risk category. His treatment plan is three and a half years of DAILY chemotherapy. He receives daily oral chemo, intravenously chemo and chemo in his spine. King also has an enzyme deficiency called G6PD that complicates his treatment. It is a rare and deadly combination to have both G6PD and leukemia. Leukemia affects the white blood cells and G6PD affects red blood cells. G6PD is lifelong there is no cure. Triggers are viruses such as the common cold or flu, soy, beans, medications or foods with sulfites, products with menthol (Halls, Vicks vapor rub), peppermints, and moth balls. Avoidance of triggers is critical as once triggered it can be fatal. At this point King takes 73 pills monthly and it will continue to increase as his weight increases. King has had brain swelling and still has nerve damage throughout his body. He lost the ability to walk for months. King is truly a walking miracle. He goes through things that many adults are not able to tolerate. He’s had more spinal taps in two years than an average person will have in their lifetime. We are eternally grateful for each and every day King wakes up to spend another day with us. He’s a strong boy with the heart of a lion. Although we were devastated with the diagnosis, we shower King with positivity each day. Years from now when King is older, we want him to look back at this and say even though I have been through so much, I am a warrior and happy that cancer is just a memory. He will be the change we wish to see in the world. Hence his hashtag and pose; #KingStrong. Drake’s song Hotline Bling and Calvin Harris’ song featuring Rihanna, This Is What You Came For are the only two songs that got King out of bed after the first few weeks of treatment. Due to the nerve damage; candy, food or toys would not get him out of bed. King wants to meet them in person one day to thank them for positively impacting his life. We truly appreciate the various means of support such as the prayers, positive messages and donations. It reinforces that we are not alone and encourages us to keep fighting. 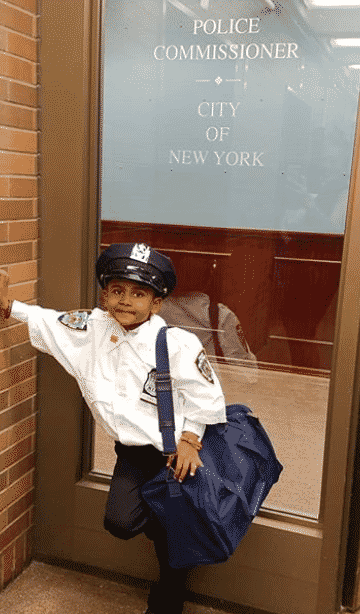 On Tuesday, October 2nd King was sworn in at One Police Plaza as a police officer and thirty seconds later promoted to a three star chief – Chief King! He has been on various television stations such as PIX11 and News12LI. 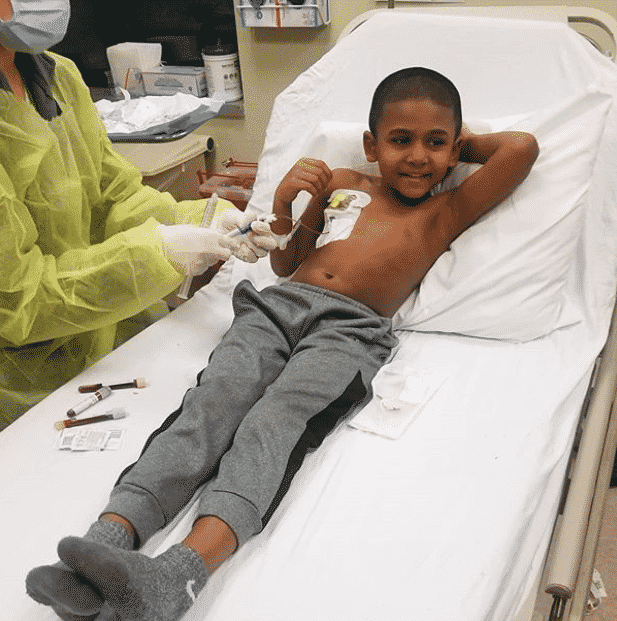 King has many future goals one of which is to be the first global leukemia model. King has walked in NYFW and JCFW this year. He will also walk at Bloomingdales. King loves to help others, especially his three year old brother Mesiah and nine month old baby sister Faith. King recently told us that he wants to build homes for homeless people and then build one for himself. King is an AMAZING big brother who loves waterparks and superheroes Ironman, Spiderman and the Power Rangers. We want to start a foundation to honor King. The foundation will cover the costs of mortgage/rent and utilities for families diagnosed with a life threatening illness. Our ultimate goal is to replace the income of a parent for at least one year so parent(s) can stay home and take care of their child without having to worry about bills. When a child is diagnosed with cancer it affects the entire family. Caregivers/guardians should NOT have to worry about bills when they are told “YOUR CHILD HAS CANCER”. Treatment should not cause secondary cancer. 75% of survivors deal with chronic medical issues once the treatment is completed. Yet, Pediatric Cancer is heavily underfunded—less than 4% of the federal budget for cancer research is dedicated to childhood cancer each year. Despite all that King has been through and continues to go through, he inspires us and countless others every single day. We believe everything happens for a reason and it is all about perspective so stay as positive. Find the good in everything. We are childhood cancer advocates. Research funding is important as it can lead to less toxic treatment and cures. Most patients die from the complications associated with cancer and its treatment. Cancer does not define us, WE define cancer. Our mission is to spread global awareness about childhood cancer in hopes that one day research is done to declare cancer a thing of the past. All children deserve to grow up! If you need some inspiration today or would like more details or pictures of King’s journey, please visit his Instagram or Facebook@KingFightsCancer. His website is www.KingFightsCancer.com. On days he is not feeling well we read him the notes that our friends turned family send to encourage him to keep fighting!